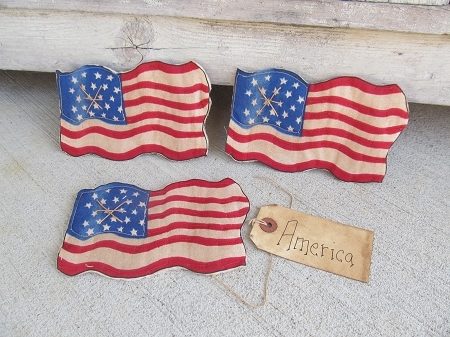 Primitive Americana Wavy Flag Set of 3 Bowl Fillers. These are a neat version of flag bowl fillers. They lay flat and are stiffened. You'll get a set of 3 with a primitive tag that has various Americana sayings on them. Size of each flag is 6"x4". Great for bowls and to add with her other great bowl fillers! Hand made by Lynn. ONLY 1 SET LEFT!